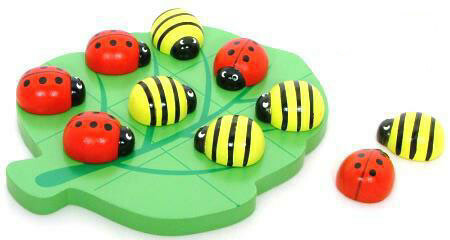 Playing Noughts and Crosses is fun but playing it with Bees and Ladybugs is even more fun. This is a small, simple Tic Tac Toe toy that can easily slip in a bag and be taken anywhere. The wooden game pieces are solidly made with a coat of bright paint, a lovely smooth finish and the playing board is shaped as a lovely green leaf. If you have ever enjoyed noughts and crosses this is a great way to introduce your kids to this classic game. Size: The board is 17cm x 20cm. The pieces are 3cm long by 2cm wide. We like this because: "Great to take on a trip and we love the cross eyed ladybirds ." Received all ordered goods well before Santa arrived. Well packed and damage free. The Grandkids loved their presents. My 3yo grandson loves to cook and mum says that there is always something cooking in his brand new pots. The Wooden clock has been a great success as my 5yo grandson who is heading off to school this year and is always asking us to teach him the time. It is so easy to follow. I love wooden toys and ninety percent of my gifts to my grandkids are all wood based. Thank you for giving me such a great selection when shopping for any of my 9 grandkids who range from less than one year to 5 yo's. Will definetly be visiting your site again when it arises.